Here from Fintan O’Toole of The Irish Times comes perhaps the best dissection I’ve seen so far of what’s been smashed up – and what’s potentially been unleashed – by the result of the UK’s EU membership referendum vote. The fact that the analysis comes from beyond the UK’s borders – Dublin to be precise – somehow feels both appropriate and not entirely coincidental. Did you ever see a slightly drunk man trying that trick with the tablecloth? He thinks he can whip the cloth off the table with a fast, clean snap, but leave all the crockery perfectly intact. He gives a sharp tug and stands back with a triumphant flourish as the plates and glasses come flying to the ground and shatter all around him. That’s what Brexit is like. Those who have driven it have successfully pulled the cloth off the table – the underlying fabric of modern Britain has been whipped away with a shocking suddenness. They stand in triumph, sure that they have pulled off the trick of removing a whole layer of political reality without disturbing all the family tableware. They have yet to notice that so much that was on the table is now at their feet, broken, perhaps irreparably. Brexit has achieved the breathtaking feat of causing deep cracks in four different polities at a single stroke. One of them, most obviously, is the European Union. For the first time in its history, the EU’s engine has gone decisively into reverse. At the simplest level, it has been a process of relentless expansion – no large entity in modern history has grown so rapidly since the United States in the 19th century. And now the steady advance has become a full-blown retreat. The whole psychology of the European project has been turned on its head – instead of ever-widening frontiers, the EU now has to think about how to prevent a retreat from becoming a rout. The rout that must be feared is a disorderly overthrow of liberal European values. When Nigel Farage speaks, as he did in his moment of triumph early yesterday, of victory for “the real people, the decent people”, the undertone is that nearly half of the UK’s voters are neither real nor decent. England has not had the time, nor made the effort, to develop an inclusive, civic, progressive nationalism. It is left with a nationalism that is scarcely articulated in positive terms at all and that thus plugs into the darker energies of resentment and xenophobia. But this is not just an English disease. Brexit is a huge boost to the European far right. The questions that flow from it are not just about whether the Netherlands or France or Denmark might follow where England has led. It is about whether the blowback from failed austerity, the hubris of the euro project and the relentless rise of inequality will provide a fair wind for racism and chauvinism. This will please some of the Brexiters, of course – at least until the more moderate of them realise that they are, after all, Europeans and that the fate of Europe is their fate, too. But they surely cannot be so complacent about the other three polities they have managed to crack. One of them is the UK. A second Scottish independence referendum is inevitable – and this time the pro-independence side will have the enormous advantage of putting forward a conservative proposition that has overwhelming popular support: keep Scotland in the EU. The utter refusal of the pro-Brexit campaigners, almost of all of whom would claim to venerate the union, to take the break-up of the UK seriously suggests that deep down, they really don’t care that much about it. English self-assertion has trumped UK preservation. The consequences will play out over the next decade: the chances are that by the 10th anniversary of what the victors are hailing as Independence Day, it will be English independence that is explicitly celebrated. And this has deeply unsettling implications for the third cracked polity, Northern Ireland. A few pro-Remain voices, such as Trades Union Congress general secretary Frances O’Grady, tried in the referendum debates to make a gentle plea to voters to think about Ireland and the Belfast Agreement. They went unheard. English nationalists, it turns out, wouldn’t give the froth off a pint of real ale for the Irish peace process. They have recklessly imposed an EU land border between Newry and Dundalk, between Letterkenny and Derry. What grounds are there to believe that when they come to power in their own little England, they will care about (or pay for) a province they clearly regard as a closer, wetter Gibraltar, an irrelevant appendage of the motherland. It beggars belief that the Democratic Unionist Party (DUP) made common cause with a movement whose logical outcome is the end of the union. The last piece of the tableware that must now be badly fissured is the least expected: England itself. The English seem to have been utterly unprepared for how deeply divided they are, how bitter and angry the Brexit debate would be, how political assassination would return to the streets of England. David Cameron, in one of British history’s greatest miscalculations, thought of the referendum as the lancing of a boil. The bubble of nastiness that had built up in the Tory party over decades would be burst once and for all by the cold prick of economic realities. Instead though, the referendum merely revealed how deeply the English body politic is infected with rancour and distrust. That distrust extends far beyond the dominant political class – to church and trade union and business leaders and to the whole idea of objective expertise. Every time a Remain campaigner said the word “experts”, another Leave voter was born. And this raises a huge question: where is the source of authority in the brave new England? Many of the most prominent Leave campaigners are naked chancers. They made stuff up with gay abandon, but when they come to power in the autumn, they will be the establishment they have told everybody not to believe. 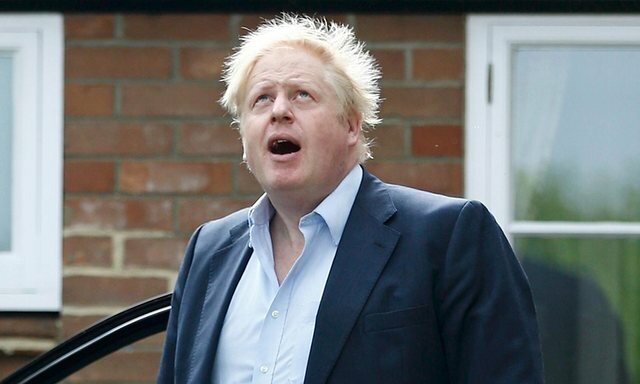 Prime minister-in-waiting Boris Johnson is merely the winner of a Winston Churchill impersonation contest. He has a streak of Churchill’s brilliant opportunism and reckless charm, but he does not have behind him the national consensus that an existential struggle created behind Churchill and he is, in everything but girth, a lightweight. It is not even clear that the Brexit coalition can itself hold together in any meaningful way. It is, after all, a weird conjunction. Brexit is not so much a peasants’ revolt as a deeply strange peasants’ – and – landlords’ revolt. It is a Downton Abbey fantasy of toffs and servants all mucking in together. But when the toffs, as the slogan goes, “take back control”, the underlings will quickly discover that a fantasy is exactly what it is. The disaffected working- class voter in Sunderland, rightly angry about being economically marginalised and politically disenfranchised, will wait in vain for the magical billions that are supposedly going to be repatriated from Brussels to drop from the clear blue skies of a free England. There is, of course, a tried and trusted way to hold this kind of rickety social coalition together. It is to turn up the volume on nationalism and xenophobia, to deflect the inevitable disappointment anger onto Them. The English nationalists have just lost their favourite scapegoat, the EU. When their dream turns sour, where will they find another?